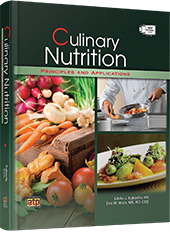 Culinary Nutrition Principles and Applications demonstrates how the science of nutrition and the art of food preparation can be combined to provide the knowledge necessary to plan and prepare nutrient-dense menu items. The first six chapters of this engaging textbook explain the functions and food sources of proteins, carbohydrates, lipids, water, vitamins, and minerals and their roles in the digestion and absorption process. The other nine chapters describe how to apply nutrition principles and healthy cooking techniques to create flavorful and appealing, nutrient-dense menu items. A proven process for modifying recipes is demonstrated for each menu category and an interactive set of digital learning resources is included.